Every now and then, but especially when I lived on Great George Street, I used to see a guy riding his bicycle down Sydney Street (the wrong way on a narrow one-way, mind you), carrying his case of beer in one hand and steering with the other. He could use this. 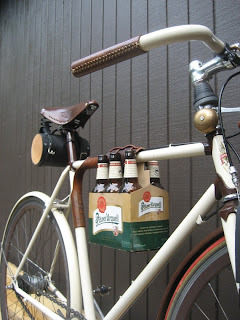 Someone has ingeniously re-purposed an urban bicycle polo mallet holder to act as the perfect 6-pack carrier for bikes. But... urban bicycle polo, you say? What's that? I had no real idea, either, until I saw this. This one has it beat by age and volume. 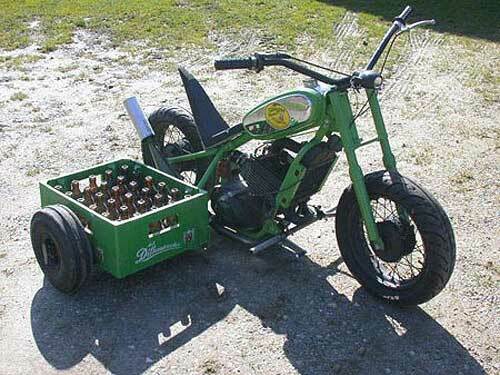 This one takes the mini-cake with a sidecar. This one wins for style and volume. This one takes the overall title, for volume, population, and danger. 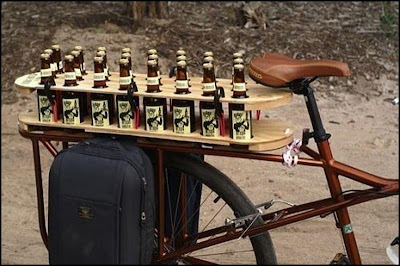 A simple Google search will reveal many more interesting examples of when beer and bicycles collide. How about this, in use here to return empties. But has pulled Full size Hammond Organ with Leslie amp and gear to make it work.